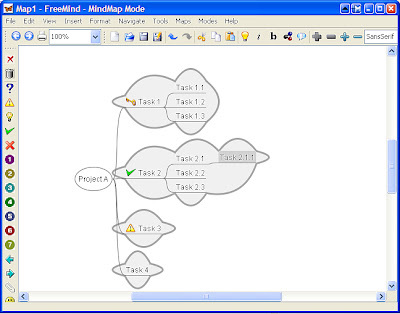 Freemind (freemind.sourceforge.net) is an open source Mind Mapping software. It is easy to use, and comes with a whole load of functions. At times, Gantt Charts may not be the best way to map out the project tasks and some project managers like to view their activities in the form of mind maps. This is useful for high level initial project planning when the PM just want to sketch down his plans and key tasks and activities. Free mind is espcially useful for this aspect. You can create multiple branches, link within the mindmap and create external URL or document links. You can also add in icons and even put the mind map up as Flash on your web site. Personally I like this tool very much. I wish they have a Windows Mobile or Symbian version. I like to combine FreeMind and GoalEnforcer Goal Mapping (a project oriented goal mapping tool). GoalEnforcer can export to/import from FreeMind.